Welcome to the official website of the author L.K. Samuels! New! In Defense of Chaos is out and on sale! To buy by check: Freeland Press, P.O. Box 22231, Carmel, CA 93922. No postage or shipping fees– Just $19.95. Chaos gets a bad rap. Few people realize that without the dynamics of chaos, order would not exist. In fact, nothing would exist. Without chaos there would be no creation, no structure and no existence. After all, order is merely the repetition of patterns; chaos is the process that establishes those patterns. Without this creative self-organizing force, the universe would be devoid of biological life, the birth of stars and galaxies, and the singularity of matter and energy — everything we have come to know. In Defense of Chaos examines why chaology provides a slew of scientific evidence that open-ended, adaptable and evolving systems work far better than closed-ended, inflexible ones. Not only do dynamic systems work better, but they foster self-determination, social harmony and a choice-driven society. The nature of the physical world favors the freedom for people to self-organize and self-govern without the interference of external command and control structures. With the help of Quantum Mechanics and the Uncertainty Principle, chaos theory proves that the universe is not based on the old Newtonian physics of order and precision, but rather on probability and uncertainty. Events often arise by chance, with no more reliability than a pinball machine. The future leaves no footprints. The likelihood that the sun will come up each morning is just that – a high probability, not a certainty. In Defense of Chaos takes the reader far down the rabbit hole where few are willing to explore, pitting the “unstructured order” of chaos against the “structured order” of linear-based politics. 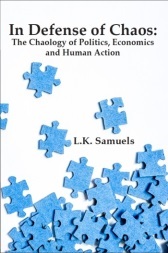 The book not only exposes a new way of thinking, but shows why chaos theory and complexity science will revolutionize the social, political and economic structures of the world. Announcement: My second book will be coming out in late 2018 or early 2019. It is titled “Killing History: The False Left-Right Political Spectrum and the Battle Between the ‘Free Left’ and ‘Statist Left,’” and has over 1,500 footnotes. It will show how screwed-up the political dichotomy has become and why. It will reveal a profusion of hidden political secrets, such as Hitler’s ties to the Communist Party of Germany and to Social Democracy. As for Mussolini, he called himself the “Lenin of Italy” and supported the 1917 Bolshevik revolution while leading the Fascist Revolutionary Party. Of course, such Marxist influence on both German National Socialism and Italian Fascism make an absolute mockery of the traditional political spectrum. I also delve into the true polar opposites on the political spectrum: John Lockean liberalism versus authoritarianism, as was demonstrated during the first stage of the French Revolution. Feb. 19-21, 2016 (Fri.-Sun.) — I will be speaking at the next “Anarchapulco” Conference (www.anarchapulco.com ) in Acapulco, Mexico on “The Significance of Chaos Theory and Complexity to Liberty.” Anarchapulco is billed as the largest international anarcho-capitalist in the world. January 16, 2014 (Thur.). Speech at the Silicon Valley Taxpayers Association, located at Harry’s Hofbrau (banquet room) from 6:15 PM to 9:00 PM, Speech at 7:00 PM, Title of speech: “In Defense of Chaos and Inside the Belly of the eminent Domain Beast in Seaside, CA.” Non-members for speech is $10 or $15 for a couple. More Info at: www.svtapayers.org. September 20, 2013 (Fri.) Speech at NorCal Liberty Summit at 6:30 PM at the DoubleTree by Hilton Sacramento, which is located at 2001 Point West Way, Sacramento, CA. More information: Janine Kloss at lpsacchair@gamial.com. NorCal Liberty Summit is a three day conference Sept. 20 to 22.